Gut Microbes May Play Deadly Role In Malnutrition : Shots - Health News The bacteria that live in humans' guts influence weight gain and health. 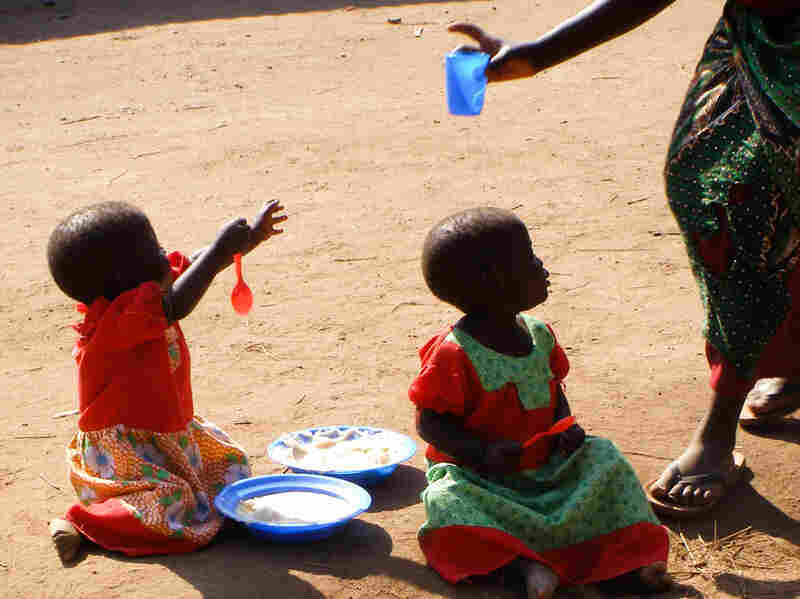 By studying twins in Malawi, scientists have found that changes in this microbial community may also turn malnutrition into a fatal condition. 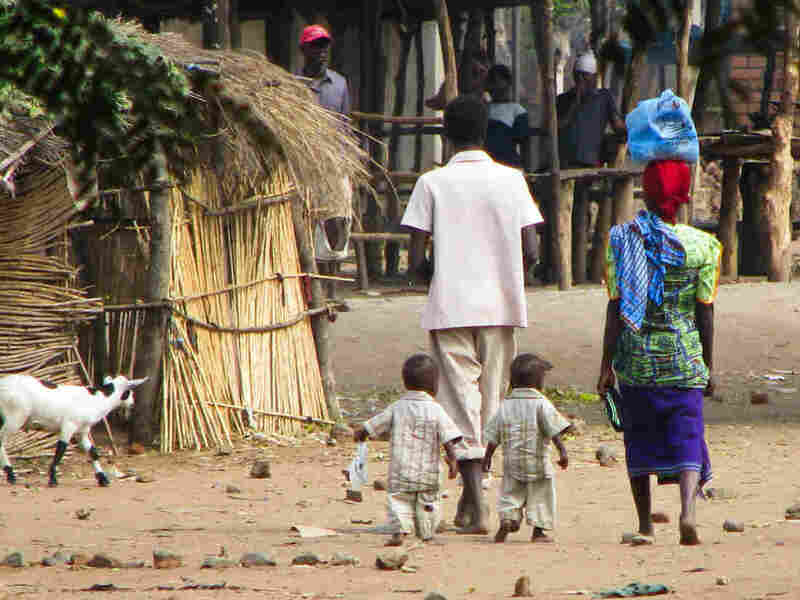 Researchers followed 300 sets of twins in Malawi for the first three years of their life. In many cases, only one twin developed severe malnutrition, while the other remained healthier. There's a part of our body that's only now getting mapped: the trillions of microbes, mostly bacteria, that live in our guts. Some scientists describe this community as a previously unnoticed vital organ. It appears to play a role in how quickly we gain weight and how well we fight off disease. A study published in the journal Science suggests that changes in this community of microbes also may cause kwashiorkor, a kind of deadly malnutrition. If you've seen the horrifying pictures of famine — listless children with swollen bellies — you've seen the face of kwashiorkor. It's not the most common form of malnutrition, but it is the most deadly. It can hit a child quickly. Nutritionist Rebecca Stoltzfus, who directs the international nutrition program at Cornell University, says there's something baffling about this disease. Some children get it, while others, who seem to be eating the same diet, do not. Twins in Malawi helped scientists discover a role the gut microbiome appears to play in severe malnutrition. "What causes some malnourished children to transition into kwashiorkor, remarkably, remains a mystery after all these years," she says. Many scientists, she says, suspect that there's something going on inside the gut. But what? Enter Jeffrey Gordon, from the med school at Washington University in St. Louis. Gordon has pioneered studies of such microbial communities — what scientists now call the microbiome — and how this microbial community affects conditions such as obesity. Gordon decided to take on kwashiorkor. He joined forces with other scientists who were already working in Malawi, a country in southern Africa where malnutrition is common. They decided to study twins, so that they could compare children who were genetically similar, and living in similar environments. "We recruited a group of 300 twin pairs, identical and fraternal, and followed them through their first three years of life," he explains. None of these twins, at the beginning, were malnourished. But when they came back for checkups, a pattern emerged in almost half of the pairs of twins: "One twin, in the pair, remained healthy, and the other twin developed either moderate or severe malnutrition." These children immediately were treated with therapeutic food. But before they were treated, and again afterwards, for several weeks, the scientists took samples of their feces, to study the bacteria that lived in the gut. Gordon says, the children with kwashiorkor had a different population of microbes than their healthy twins. During treatment, a healthy community of microbes started to emerge, but the improvement didn't last. It was clear evidence that this abnormal community of microbes was associated with malnutrition. But could it actually be the cause of their disease? Gordon wanted to see if these microbes caused similar symptoms in laboratory mice. So he transplanted samples of the microbial communities from just three pairs of twins into special strains of mice that were raised in completely sterile conditions. Their bodies contained no other microbes. The mice got food similar to what children eat in Malawi. And in two out of three cases, the mice that got microbes from the sick children started to lose weight. Gordon says, it suggests that down the road, we might be able to treat severe malnutrition with better food and also new intestinal microbes. "Next-generation probiotics!" he says. Other scientists aren't ready to go that far. First of all, it's impossible to draw many firm conclusions from observations of just two or three pairs of mice. Even though the mice lost weight, you can't say they had kwashiorkor. And finally, we're a long, long way from a probiotic treatment. But they agreed that this hint of a link between microbes and severe malnutrition is intriguing and worth pursuing further. Stoltzfus, meanwhile, was struck by something else in Gordon's study. "The twin study makes it all the more perplexing: How did these babies get so different?" she asks. They were genetically the same, growing up in the same home. Yet it was generally just one child in a pair of twins who had kwashiorkor — rarely both twins together. "How are these babies being cared for? What's going on between these twins? How are they having such different life experiences," Stoltzfus asks. Answering such questions, she says, means getting into homes and understanding how families work. It's something we can do right away, she says. And it might prevent kwashiorkor from developing in the first place.